After painting my Crystal Brush entry and yet another character model it was nice to relax a bit and paint some rank and file models. These guys take a different approach to painting then my character models. For starters I painted them in groups of ten. They were all primed with a bone colored primer from Army Painter. This alone helped cut an hour off my painting time, easy. They then all got a wash of Agrax Earthshade. Instead of just slathering the wash all over the models, I was a little more careful with my application. 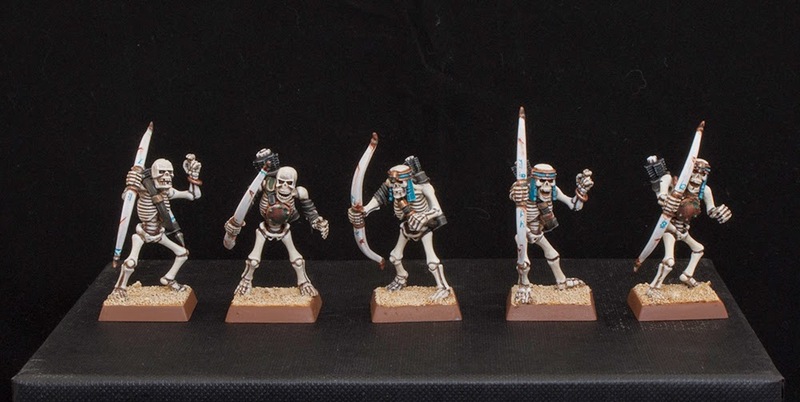 I was careful to keep the wash mostly just to the recesses and not to get any on the large flat areas of bone on their arms, legs, and skulls. It takes a little more time, but saves me a lot more later on when I don't have to neaten it up as much. From this point on I kind of break them down into groups of five. I paint the color section I'm working on all the way to completion on my first five, then do the same on the second five before moving on to the next color. 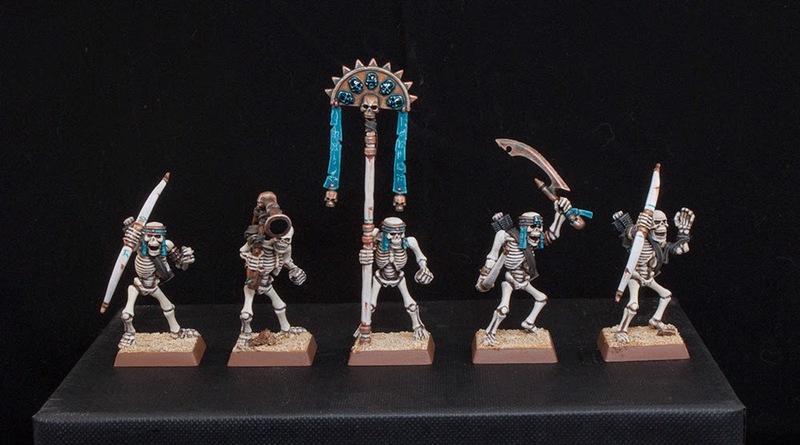 So for example, I would finish the bone completely on all ten of them, before moving on to the white. I drybrushed the bone, before going back over it with a solid coat of paint to smooth it out. This all then got a line highlight of white. I did the drybrush to make certain thin areas, like the ribs and fingers, were easier later on, and to act as a sort of rough guide for highlights. The white was painted with a base coat of Rakarth Flesh, the recesses washed with Agrax, and then given a light coat of white. I let the base coat show through a bit here so it's slightly off white. This is the highlighted with pure white. The other details were picked out with Charadon Granite, Hawk Turquoise, and gold and brass. To break up the bows and quivers a bit I painted either designs with lines and dots, or hieroglyphs copied from the Army Book. I also weathered them a bit with tears and stains. The command section obviously took a little more effort. I tried to make them look more important by painting some of the skull decorations as gems. This took very little effort but makes them stand out and look like they are painted to a higher quality then they really are. This is actually a trick I use on a lot of rank and file models. I will paint just a few select areas or colors to a higher standard then the rest of the model. By doing this it draws the eye to those areas and lets you get away with a few mistake in other spots. In total this probably took me about eight hours per group of ten, maybe even less. 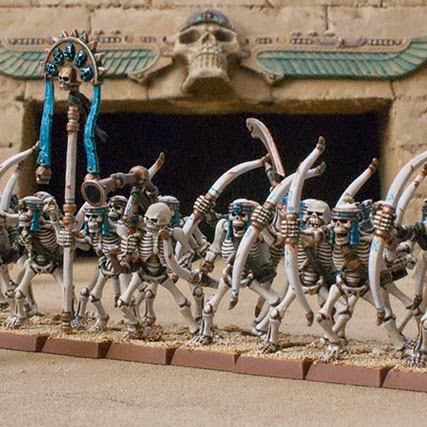 When compared to the close to 100 hours I probably spent on my Tomb King on Chariot, you can see why I use this method for rank and file minis. 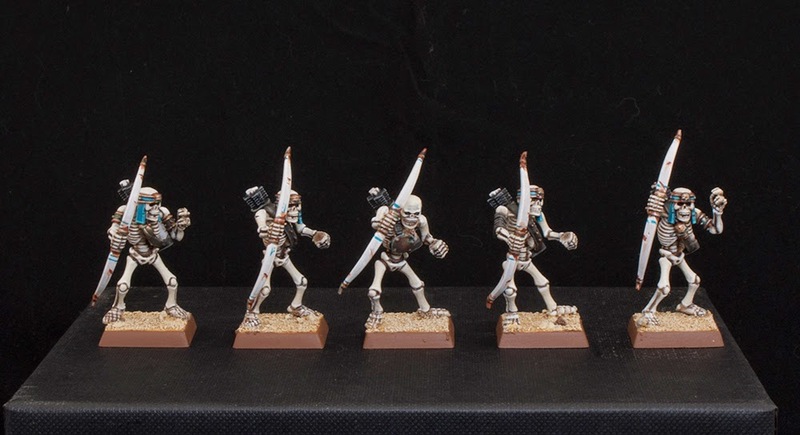 These guys already make my spearmen look less finished. I painted the spearmen almost three years ago now and relied more on drybrushing. I often post in progress shots of whatever I am painting or modeling on Twitter and Facebook, so be sure to follow me there for daily content!